Winner of the third place in last year’s Hackaday Prize was [Chris Low]’s Light Electric Utility Vehicle. In case you think that once a Hackaday Prize is in the bag then that’s it and the project creator packs up and goes home, [Chris] dispels that idea, he’s invested his winnings straight back into his project and posted his latest progress on an improved Mk3 model. We first covered the Light Electric Utility Vehicle back in June 2015 when it was first entered for the 2015 Hackaday Prize. The aim was to produce a rugged and simple small electric vehicle that could be powered by solar energy and that was suitable for the conditions found in South Sudan, where [Chris] works. 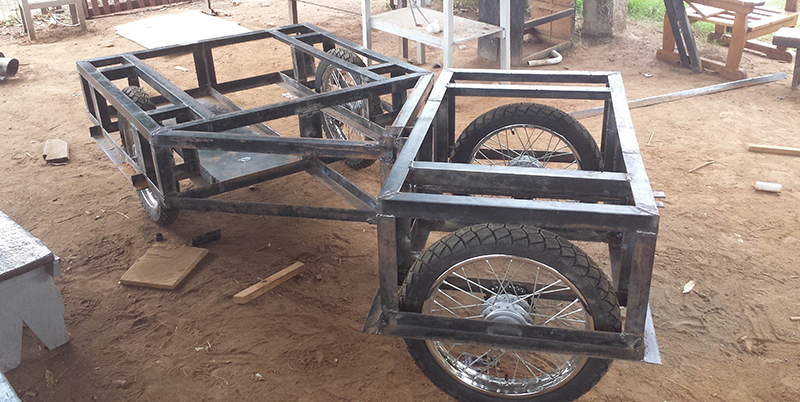 The vehicle as we saw it then was an articulated design, with chain drive to bicycle-style wheels. The Mk3 version by comparison has lost the articulation in favour of rack-and-pinion steering, has in-hub motors instead of chain drive, and now features coil-spring suspension. You might comment that it has lost some of its original simplicity and become something more like a conventional electric UTV, but along the way it has also become more of a practical proposition as an everyday vehicle. [Antti] has gained a bit of a reputation over on Hackaday.io – he has a tremendous number of FPGA projects on hackaday.io, and they’re all open source. If you’re looking for street cred with FPGAs, [Antti] has it. His Hands-on experience with FPGAs and CPLDs stretches back to the very first chips in the 70s. We’re so happy that he’s working to share this depth of knowledge, and that includes this talk he gave a few weeks ago at the Hackaday SuperConference. Take a look and then join us after the break for an overview of the FPGA terrain, then and now. Irrigation is a fairly crude practice. Sure, there are timers, and rain sensors, but all in all we’re basically dumping water on the ground and guessing at the right amount. [Reinier van der Lee] wanted a better way to ensure the plants in his vineyard are getting the right amount of water. And this is Goldilocks’ version of “right”, not too little but also not too much. Southern California is in an extreme/exceptional drought. Water costs a lot of money, but it is also scarce and conservation has a wider impact than merely the bottom line. His solution is the Vinduino project. It’s a set of moisture sensors that work in conjunction with a handheld device to measure the effect of irrigation. Multiple moisture sensors are buried at different depths: near the surface, at root level, and below root level. This lets you know when the water is getting to the root system, and when it has penetrated further than needed. The project was recognized as the Best Product in the 2015 Hackaday Prize, and [Reinier] presented the project during his talk at the Hackaday SuperConference. Check out the video of that talk below, and join us after the break for a look at the development of this impressive product. [Sarah Petkus] started off her career as a visual artist with traditional mediums. She has a webcomic called Gravity Road, but somewhere along the line she wanted her creations to come alive. These characters are robots – artistically designed robots – and turning this type of art into a real object isn’t something that happens very often. Robots usually aren’t art. A Roomba is just a vacuum cleaner that’s meant to turn on a dime, thus the circular shape. The welding robots in a car factory aren’t art, they’re only tools to assemble cars. These are just devices built for a single purpose, and art is for any or every purpose. It’s not something you can really design, but you can engineer a few interesting solutions.